So what to do when you have preflighted a file and you have discovered there is or might be a problem with it? pdfToolbox Desktop provides a number of different tools to help you with the analysis of problematic PDF files; this article gives you an overview of the different possibilities. In the Switchboard, under "Reports", you can find a number of possibilities to create inventory reports from your PDF document. 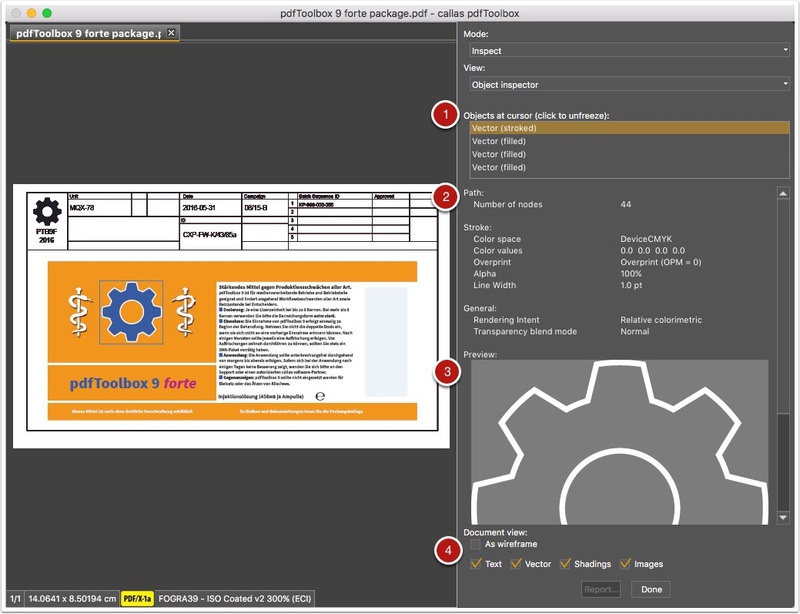 This lists all fonts, images, colors or layers in the PDF document with their properties. The "Colors" function in the "Reports" group of the Switchboard. Click "Execute" to generate the report. 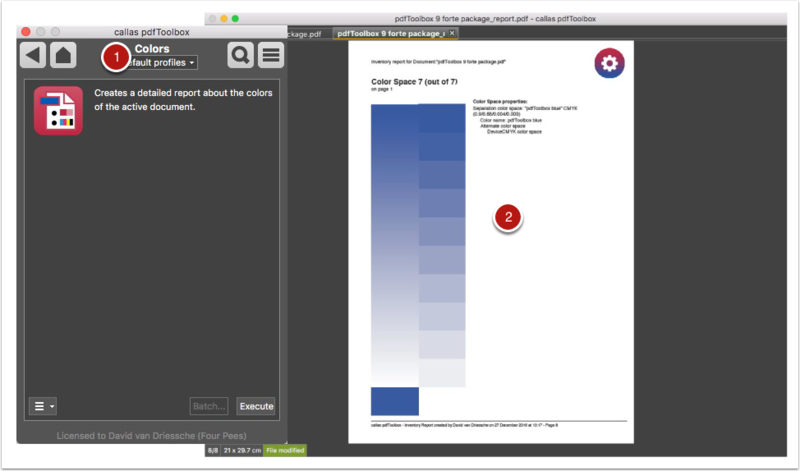 The generated report: a PDF document where each page details a particular color space that was found in the PDF document. 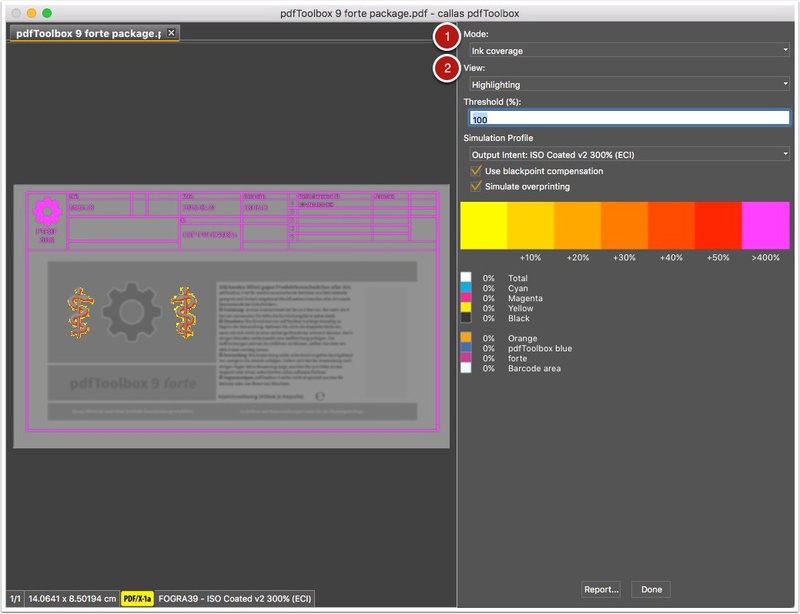 Sometimes knowing which objects are in the PDF document isn't sufficient, and in those cases the visualizer technology in pdfToolbox comes to the rescue. To access it, use one of the "Visualize..." menu items under the "View" menu in pdfToolbox Desktop. Depending on the menu item you use, a different visualizer "Mode" will be shown. You can use the pull-down menu here to select different modes without having to go through the menus again. Each visualizer mode has different views. Use this menu item to select a different viewing mode. Each visualizer mode has different additional information and options shown below. In the example you can see the ink coverage in the displayed PDF document using a thermometer color overlay. Moving the mouse over the document will list the exact color mix at each point in the document. While technically part of the visualizer functionality, the "Object inspector" deserves its own mention here. Use the "Views" > "Object inspector" menu item to activate it. As soon as you move the mouse over the document, you're going to see a list of all objects on the page that are under the mouse. You can at any time click on the document to "freeze" that list so you can explore it (click on the document again to "unfreeze" the list). For the object that is selected, the object inspector shows a summary of the properties of that object. Also for the selected object, a preview is shown. When examining a document, you can choose to see it in wireframe mode by checking "As wireframe", or you can hide certain object types by deselecting them in this area. In case you have still not found what is wrong with the document or an object, pdfToolbox Desktop has a number of much more technical tools you can use. You can find them under the "Tools" > "Explore ..." menu items but due to their more technical nature they are beyond the scope of this introductory manual.